My cat, Koi, is 19 years old. 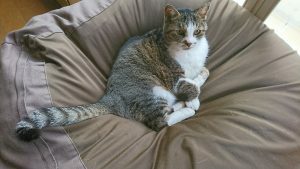 She is a grey/brown tabby with white markings. She was almost perfectly silent for most of her life, but she has recently starting yowling like a banshee and it is driving me insane. I decided to write this post to document what I am trying to do to help restore my sanity, and by doing so, perhaps help others in the same predicament. First of all, let me describe the particular level of hell that I am currently living in. Koi sleeps on my bed, so we go upstairs together to sleep at night and she settles down. (Sometimes the air conditioning gets too cold for her, so she moves to another room.) Within a few hours (e.g. 1am), she wakes up, jumps off the bed, and starts yowling. She paces around my room, going from her water dish (an extra one that is there to encourage her to drink water due to renal issues) to the window (where she has access to an outdoor litter box on the balcony) to my bedroom door. She might then leave the room and go wandering through the whole house yowling. Once she starts, she rarely stops. If I wake up and pet her, it will get her to stop for a few moments, but she soon resumes the shouting. The only thing that will get her to stop is if I wake up, pick her up, and restrain her until she calms down. Sometimes she will acquiesce fairly quickly, and other times she will struggle to break free, resisting my attempts to calm her down and getting herself more worked up in the meantime. She will do this approximately three or four times every night (e.g. 1am, 2:30am, 4:30am, 6:00am). It is crazy-making. I have come to think of this as two separate issues, each with their possibilities for improvement. The first is yowling, and the second is waking up throughout the night. Looking back, I think I can pinpoint the start of the yowling. When Koi first started yowling it was because she had a bladder infection. When she tried to urinate or defecate, she would pace between her cat litter boxes (I have three of them placed strategically around my house) and just SCREAM. Since she had been an almost entirely silent cat to that point, it was really jarring, and I would run to check on her every time. I think now that that was the seed of the connection in her head between yowling and my presence. I am not sure how I could have done it differently, because she was in actual pain, so it was natural for me to run to her aid, but I think this planted the idea in her head that if she yells, I will come. 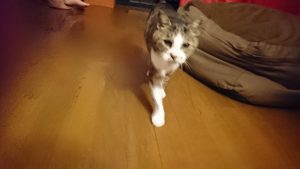 Trying to break that association has been almost impossible because, as an elderly cat, she is not able to learn new things as well as she could when she was younger. The yowling has been happening for a few years now, while the waking up has been for a few months. They are clearly different issues, although it has taken me a while to realize this. As an elderly cat, Koi suffers from renal failure. She also has a polyp in her bladder that we are monitoring. She is almost completely deaf to everything except for the loudest, most proximate sounds. Her eyesight seems to be fine, but she is almost definitely suffering from dementia as evidenced by her seeming ability to forget who I am unless I touch her. She has slightly elevated blood pressure. She has joint pain due to arthritis. I bet your cat has done some or all of these things. All of these have a particular meaning in the mind of your cat — “feed me”, “pet me”, “play with me”, “scritches behind the ears, please”, “let me out”. Your job is NOT TO GET ANNOYED when any of these happen, but to get inside the mind of your cat and try to figure out what she is trying to say to you. Remember: cats vocalize to HUMANS, not to other cats. When your cat is meowing, she is specifically trying to get YOUR attention. You should interpret all of the meows as being directed to YOU. In order to get your cat to do what you want her to do, you will have to start thinking like a cat. If you apply your understanding of human behaviour to cats, you will certainly fail. You must look at the world from your cat’s perspective in order to persuade her to change. It is important to note that each cat develops her own way of communicating based on your responses. So, I cannot say that “this behaviour” means “this” in all cats. It will depend on how your cat has, or has not, trained you. For example, if Koi pushes something off a shelf, it usually means “I want to go outside”. If I am consistent in letting her go outside after she does that, I will teach her that “slide, crash, precious heirloom in smithereens” means “let me out”, and she will continue to use it to get me to do her bidding. I should note, however, that soon after I noticed this behaviour (read: method of communication), I stopped putting movable things on shelves (“we can’t have nice things!! !”), thus preventing her from using that particular “phrase” to get what she wants. She adapted by using a different phrase (“stand at window looking plaintive”), and we got along marvelously thereafter. So, unfortunately, in Koi’s case, she now thinks that “YOOOOOOWWWWWWWWWWLLLLLL” means “Shaney, come here and make everything better again”. My job is to somehow break that connection. As a young cat, Koi used to do various things to try to wake me up. She has never been one to obsess about food, but she always wanted to go outside as soon as the sun was up. In a country where it starts getting light at 3 in the morning, this makes for an overall unpleasant experience. When she was younger and did this, I would wake up and very dispassionately (without making eye contact or petting her) put her in my bathroom. She then realized that yelling at me had a very negative and unappealing result and stopped doing it. She learned this lesson quite quickly. Throughout her life, she sometimes developed unwanted behaviours, but I was always able to train her to stop doing them by using techniques like that, or by figuring out what she was trying to tell me and fulfilling her (legitimate) need. The biggest issue now is trying not to reinforce the connection between yowling and my appearance. I am trying to go to her (i.e. reward her) only when she has calmed down. The problem is that she sometimes gets into a total spin-cycle where she is pacing and yowling and pacing and yowling and is not able to self-soothe. When that happens, I feel like I have no choice but to pick her up and calm her down — thus, frustratingly, cementing the connection between yowling and me. Here are things that I have tried so far, and the results. I have tried to ignore Koi when she starts yowling. This does not work. She will continue yowling and pacing for a very, very long time. By way of possible explanation: if “yowl” means “pay attention to me” and I respond to that by ignoring her, she will not be satisfied that she has transmitted her message successfully. In her brain, that means, “say it louder”. This method cannot work because it doesn’t result in successful communication. I have tried to touch her to remind her that I am here and that she is fine. This works temporarily, for a few seconds to a few minutes. She will inevitably resume her caterwauling a short time later. I am not sure if she forgets that I am there, or if she was just not satisfied with the encounter. I didn’t do the thing that she was asking me to do (“make me feel better”), so she needs to continue until I do it properly. You know how Cesar Milan (the Dog Whisperer) is always brought in to deal with badly behaving dogs and he almost always works exclusively with the owners instead of the dog? I think that paradigm can work here too. It is not Koi’s behaviour that is the problem, but my response to it. And my responses are dictated by my feelings, such as “oh, she’s so old and frail, and she has so many issues, and she has been my faithful companion for so many years, and oh, I love her so much, and she can’t help it because she’s old, etc.” It is my failure to choose the right response, due to my feeling sorry for her (which doesn’t actually help her at all), that is breaking down our communication. Here is what I am trying today. I am trying to see if I can use the old “shut her in the bathroom technique” (negative response) to curb her yowling. As soon as she yowls, I pick her up and put her in the bathroom. I did a halfhearted attempt at trying this a while back, but it didn’t succeed (not surprisingly, because it was halfhearted) and I gave up. I am going to be more clinical about it this time, and try to keep my feelings in check. I am trying to teach her that I think “yowl” means “put me in the bathroom”. I am hoping that she will realize, through my consistent response, that yowling does not result in communicating her message of “give me attention” and so she will find another way to communicate with me. The second prong in my approach, however, needs to be recognizing that she wants and needs more attention. (This is where the energy that I am using in feeling sorry for her needs to be directed.) She used to be an outdoor cat, so she was stimulated by her regular rounds of the neighbourhood, where she would rule the area with an iron paw, challenging all potential usurpers to a duel to the death. She is the smallest full-grown cat that I have ever seen, but that did not deter her from challenging all other living things on points of personal privilege (that privilege being her right to destroy all beings who dare enter her extensive domain). I used to have an arrangement where she was free to come and go as she pleased throughout the day. This made for a very happy kitty, and a very happy Shaney. All this means that she once had a very active and stimulating life, and now she does not. So now I have to figure out how to compensate for this. However, she is far too old to want to play, she won’t walk on a leash, and she doesn’t really seem to have developed any other indoor hobbies that I can use to our mutual advantage. So, the only card I can play is “lavish attention”. So this is my current gameplan. Another thing that I may try in the near future is a supplement called “Antinol” that is made from green lipped mussels. It is supposed to help with joint pain. I would prefer not to give Koi any kind of medicine if at all possible, so I am first going to extend the trial of the blood pressure renal failure medication and then decide what to do about the supplement. Last night, I had my first full night’s sleep in months. This may be a fluke, so I am not willing to use my limited good fortune as proof that anything is working just yet. However, I thought that I was certainly doomed to a life of constant sleep deprivation, so even this brief respite is worth celebrating. I will write another post once I see how my current gameplan plays out. Wish me luck! Here is an update on what I have tried and what the situation is now. Koi is taking Antinol (green lipped mussel extract) for joint pain and Semintra for her kidney disease. There is a Feliway diffuser in my bedroom. I put a small, battery-powered sensor light in my room that lights up when she walks past it at night to help with disorientation. I try to keep my sleeping and waking patterns as regular as possible. If Koi starts to yowl, I try to address it (by giving her attention, and if necessary, restraining her) as soon as possible so that she doesn’t get into a spin cycle. I haven’t put Koi in the bathroom after she yowls lately, but I think doing that had an immediate impact and made the yowls happen less often. If she starts doing it again too often, I may have to do it again for a day or two. I have noticed a great improvement, although it is still not perfect. Koi used to shout ALL THE TIME, during the day and night. The yowling has been greatly reduced. She still does it, but it is not constant, so it is manageable. She usually still wakes up once or twice a night, but she will usually just walk around and won’t always yowl (proving, again, that the two issues of waking up and yowling are actually separate). Her walking has visibly improved. She sometimes even kind of runs, or walks quickly, which she really wasn’t able to do before. I think that the Antinol is having a good effect in that regard, and that the Semintra is doing a good job of making her feel better. I have noticed that setbacks have often been caused by me not keeping to a rigid schedule. She really does not like being woken up at the wrong time to go to bed. Also, she doesn’t like sleeping in past a certain hour. If I can keep to a more regular schedule (which is really hard for me), it seems to keep her more calm. The problem has not gone away completely, but it has gone from “intolerable” to “manageable”. I am still giving Koi Antinol (2 capsules per day now, one in the morning and one at night), and Semintra. I also have Feliway diffusers upstairs and downstairs in my house. I have started to use a syringe to inject water into her mouth every now and then so she gets a good amount of water into her. The yowling has improved dramatically since last year. She usually only yowls just before she urinates, which is now once a day, and a huge amount (of urine) at once. I think the combination of medication, Feliway, extra liquids, and the extra attention that I try to give her as often as possible has caused the decrease in yowling. I am also considering giving her regular IV fluids, but I haven’t done that yet. She is 19 (almost 20) years old, and she is clearly not going to be with me much longer. I am trying to make her as comfortable as possible in her twilight years. I am very, very glad that the yowling has dramatically decreased, but I feel like she is already living on borrowed time. I will probably have to write a long, cathartic post about pet euthanasia in the not-too-distant future. Here is a page on the ASPCA website that offers some advice about “Older Cats with Behaviour Problems”. This entry was posted in How To, Pets on July 29, 2017 by Shaney.